The InfraTec VarioCAM® HDx head security 600 thermal infrared camera is ideal for fixed use and provides price-conscious users a high-end level camera for security and surveillance applications. 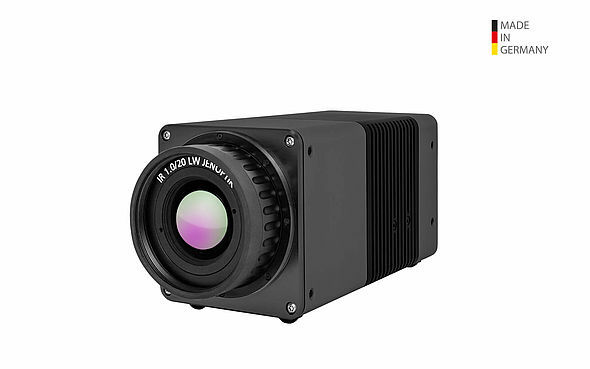 The uncooled, high performance 640x480 detector provides noiseless, long-term observation while the robust light metal IP67 housing allows for use in hard environmental conditions. The VarioCAM® HDx head 600 security can detect personnel at a range of up to 2.0 km and vehicles at a range of up to 4.2 km. Integrated permanent autofocus function allows the camera to automatically adapt to scene changes quickly and precisely with optimal focus. The camera is calibrated using special algorithms specially developed to compensate for temperature fluctuations. Therefore, the highest measurement accuracy and repeatability even at changing environmental temperatures is ensured. A large range of available precision interchangable lenses enables the use of this camera for a wide array of applications.